We finally decided to take the plunge and do what has never been done before--travel as the entire McCropder clan. 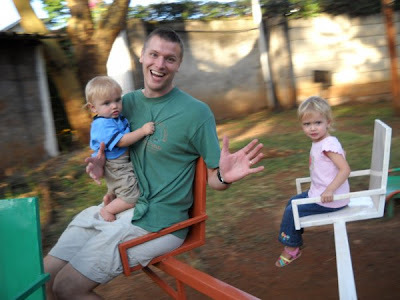 Eric, Rachel, and Jason had work visas to pick up in Nairobi, we were interested in purchasing some stuff (namely, transportation and a clothes dryer for 4 sets of diapers), and all of us just felt a need for some R&R. 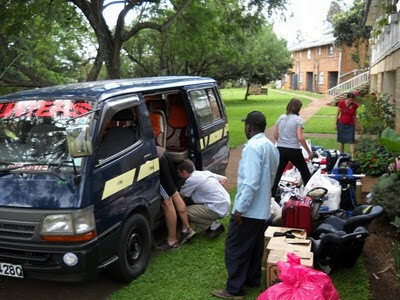 This was a difficult move logistically, since there ARE 11 of us, but Jess pulled out her superior organizational skills and found us a 14 passenger matatu van that we rented out for the trip. Just to clarify, these vans are not the same size as 15 passenger vans in the US. They are approximately the same size as a mini van (only a slight bit larger). 11 people and all their stuff fit into one of those? Oh, yes, we did. Actual vehicle seen below. Upon arrival to Nairobi, car shopping commenced. This should be saved for another post, as it was quite an experience in and of itself, but we did end up buying a van like the one seen above. Thanks to all you who have donated to make this possible! Day #2 was spent getting visas in the AM, and then in the afternoon the ladies sans kids went grocery shopping, an all afternoon event, while the guys watched the kids. Day #3 was spent doing more car shopping (didn't actually get the van until Saturday afternoon) by John and Jason, but also some fun "touristy" Nairobi activities. 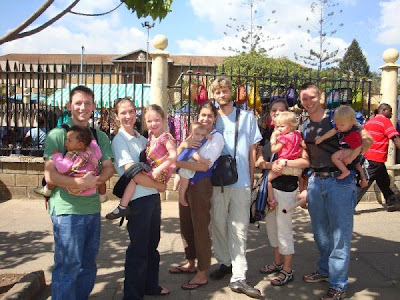 Below is the whole clan at the Maasai market, a giant open air market full of vendors trying to sell you "good deals" on premium African goods. :) We also visited the Giraffe Park, awesome photos of which can be seen on the McLaughlin blog. Basically, the park houses 10 of the existing 300 Rothschild's species of giraffes, which almost were extinct 30 years ago, at a special reserve. For about $1.25 for residents, $9 for non, you can feed a giraffe out of the palm of your hand...or from your pursed lips. :) Quite a time! We also decided to go out to eat that night at a Korean BBQ restaurant. 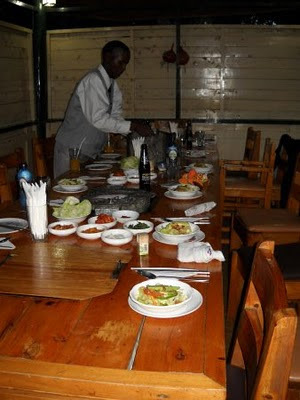 The food and experience were fantastic--the restaurant was composed of small open air cabanas so our group of 15 (Jason's brother Eli and 3 sons joined us) had our own "house" to eat in. The meat got grilled right on our tables. We realized, too late, that this restaurant might not be the most appropriate for 8 kids under the age of 5--flaming coals on the tabletop and all--but a good time was still had by all. Finally, on Sunday morning, we made one last grocery stop (I think we shopped at six stores in total, crazy experience) and loaded up all 11 of us, including 4 carseats, and groceries for three families for 2 months, and managed to make it back to Tenwek, exhausted but unscathed. See piles of stuff below. Like a clown car. A couple weeks ago, we got to be a part of a very special ceremony at Tenwek, namely the graduation of last year's interns. We came to Tenwek in December, and were really quite impressed at the high level of function of the interns. Graduation shortly followed and was a great time to celebrate the educational mission of this hospital. The ceremony itself was briefly interrupted by 45 seconds of chaos, as a catering fire erupted, a lady's dress caught on fire, 20 plates were immediately shattered, and a tablecloth was seized to put out the lady's dress, sending drinks across the room. But I digress. We are emphatic fans of development and missions focusing on education, for sundry reasons, but suffice to say that it is one of the things about Tenwek that has excited us from the beginning. They have 16 interns at any given time, and residency programs (for specialty education after the one year internship) in surgery and family practice. So we get to learn to be educators, even as they teach us how to do African medicine. 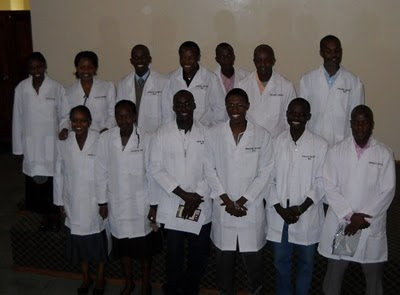 Here's the graduation picture of last year's class of interns, sporting their sharp new embroidered white coats. Of course, immediately following graduation comes the matriculation of a brand new class, and thus a dramatic shift in everyday activities. Simply put, they have a year's worth of catching up to do. Naturally. This means figuring out where each new person's ability lies, not taking anything for granted, and having a lot of grace, just as we all needed at that point in our medical education. The challenging part is that things don't run as smoothly or quickly as they did previously. The exciting part is that the onus is now on us to help them get from here to there, and that's what we're here for. Every so often, while growing up in Kenya, my dad used to describe a "case of the week" while we were all eating dinner. Sometimes these were mysterious diagnoses (like The Rift Valley Hemorrhagic Fever), and sometimes they were just interesting stories or demonstrations of how resilient patients were (like the Maasai warriors who were bitten by a lion). Thus the inspiration for our own upcoming blog series: The Case of the Week. Many of these will likely contain pictures not intended for those with especially weak stomachs (this week included). Consider yourself warned. If you are extremely queasy, beware of blog posts entitled "The Case of the Week." And of course we intend to protect patient privacy as necessary. This case was a teenage boy who presented looking at least 9 months pregnant. Since his abdomen was as tight as a drum from this mass which had been growing over the past year, we decided to operate. We intended either to take out the whole tumor or at least to get a piece of it for pathology. The boy actually had no significant symptoms and no other findings on exam. At the time of the operation, we found that this mass was decently circumscribed, and so we proceeded with totally excising the whole thing. It was attached to the stomach, liver, diaphragm, and transverse colon, so we had to remove a piece from each of those. By the end we could see that the tumor originated from the spleen. Thanks to God's grace, and the help of one of our excellent residents, we successfully removed this 25 lb tumor. The pathology showed it to be a malignant lymphoma. I have never before removed 20 percent of someone's body weight in a single operation. The patient is quite pleased with this Fader Weight Loss Plan. For those who missed our first Kenyan Cultural Moment, I would suggest it not be overlooked. Many of you may have guessed that Kenya is full of Obama fans, and admittedly, the fact that a son of one of their own would rise to become the "leader of the free world", and a globally-popular one at that, is immensely intriguing. 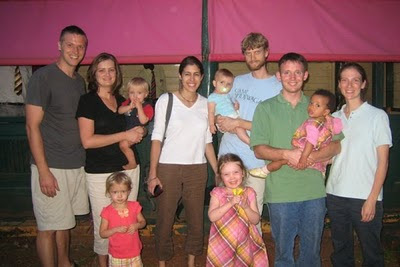 It was rumored (when we were still in the Western hemisphere) that November 2008 found Kenyan nurseries filled with little baby Baracks and baby Michelles. Our first day in Nairobi, we saw roadside stalls selling kikois (i.e. African wrap skirts) with the printed face of Obama. But as there was also one with Micheal Jackson's face, we thought less of it. As time has gone on, though, we know this is no passing fad. Obama shirts and hats are everywhere. My favorite non-photographed example is the hologram belt-buckle that switched between Obama and the First Family, depending on your angle. 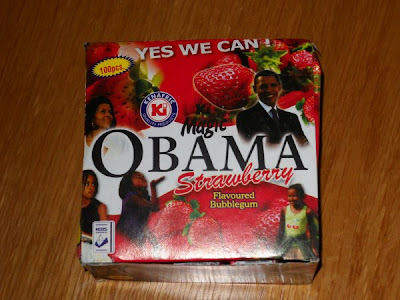 But this past weekend, I found a more personal token in the Bomet Supermarket, namely "Magic Obama Strawberry-Flavoured Bubble Gum". I'll let the pictures below speak for themselves, but please note the campaign slogans, and also the pictures of the entire family, including three girls. 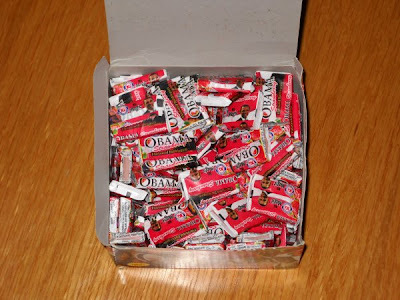 I was pleasantly surprised to find that my purchase (for about 1 USD) bought me not just awesome packaging, but individually-wrapped Obamanias. We all got to try some (and there's still much left over), and my hope was that the McCropders would be able to produce a litany of witticisms worthy of this political cartoonists' dream (like "tastes great, but loses its flavor after the first 100 days"), but alas, we're apparently not that witty. After over a month of not leaving the hospital compound here, or even getting into a car, the feeling of cabin fever had been settling in. So, yesterday, when Rachel and I had our first day off together for a while, we decided that a bit of exploring was in order. The easiest target was the village of Bomet, about a 5-minute drive away, and the standard transportation to get there is the "matatu", which is a public taxi of sorts, and most of the local ones are similar to this station wagon pictured here, with two bench seats and an open area for luggage in the back. Our drive there was great. We walked up to the hospital gate, and found a guy that could take us. (He was actually a matatu driver, unlike when the Faders and Cropseys went a couple weeks ago, and later found out that the guy they hired was just a family member who had come to see a patient in the ICU.) Since no one else seemed to be headed our way, and we didn't have correct change anyway, we just paid double to have the vehicle to ourselves ($3). We were about halfway back when the police flagged us over. We didn't understand the whole interchange, but apparently our driver had broken two matatu laws: First, no people allowed in the boot, so those two got out, and they started walking up the road. Second, he wasn't allowed to tint his windows (which they all were), which seems like a reasonable law, since I'm sure the purpose of tinting is to avoid observance of their transgressions. So the police started stripping off all the tinting. I did my part and tore off the tinting on my window, crumpled it up, and tucked in next to the door. Thankfully, then, the police let us go, and we headed down the road. We had not gone more than 100 meters, when we turned a corner, the driver stopped, and the two people from the boot caught up to the car, and climbed back in, and we drove the rest of the way back to Tenwek. Priceless. We were right. Nothing cures cabin fever like a little mini-adventure full of awesome cultural experiences. - As I experiment with a new variety of available ingredients, my culinary failures are becoming less frequent and less disastrous. 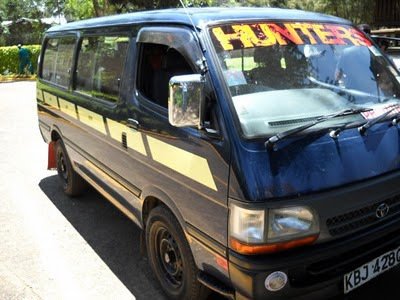 - We have ridden in a matatu just like this one… while it was transporting 14 passengers. Yes, 14. And we did not even fear for our lives, at least not constantly. - We have found friends with whom we can go running. Running here is a gorgeous experience. - Our first house guests have come and gone. We had a very wonderful time with Jason’s brothers. - Anna has made about 40 new friends here, and the entire community greets her by name. - Abi is very happy and healthy, spunky, cuddly, and smiley. Whenever Jason comes home from the hospital, she giggles and waves her little arms with joy. - Jason enjoys seeing fascinating new surgical cases every day. - One persistent difficult adjustment to life here is that we miss our families. In the first month here, we missed 5 major family events in the USA: a graduation (my sister’s, from graduate school), a birth (my cousin’s baby), a death (my great-aunt), a retirement (my dad’s), and Christmas (a major event in my family). The obvious blessing in this sadness is that we are thankful for great relationships with both of our amazing families. Our immediate family members live dispersed across three continents, five countries. This is the first time we have to adjust to living near none of them and missing all of them at once. All in all, we seem to be settling in here as smoothly as possible. We have begun to feel at home here, and we often laugh about our cultural misunderstandings. Like when I asked to buy "vegetables" and I received just a huge bunch of tough green leaves that I had no idea how to cook. 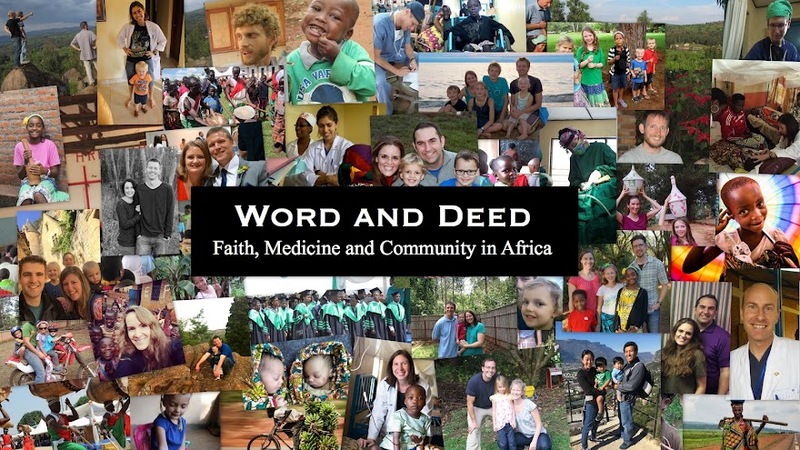 We are grateful for you who pray for us and support us as we continue adjusting to life in beautiful East Africa. One of the advantages of living on a mission hospital compound is easy access to doctors, who also happen to be our friends. I’ve never categorized myself as one of those paranoid moms, but since our arrival three months ago, we have consulted Alyssa Pfister (med-peds physician) no less than 5 times. I’m ashamed to say that one of those even included a midnight phone call! I guess it’s just a little too easy to get medical advice around here, for which we are very thankful. About a week ago, our 1-year-old son Micah developed a fairly high fever (103.7 at one point) which lasted for 4 days. On the morning of the fourth day, a group of docs decided (while watching the National Championship Game at 4:00 AM) that he should start malaria medication. I was somewhat distraught at the prospect that my poor little baby might have malaria!! I have never seen a mosquito bite on him and we are very vigilant about him sleeping under a mosquito net. We started him on the meds, and later that day his fever broke. Unfortunately, his clingy behavior continued and the following night was the worst yet. He was screaming in pain (very uncharacteristic of the chill “moo-man”), but we couldn’t see anything wrong. The next morning, we noticed a rash on his torso and his neck. Now, I was actually relieved because I had seen this before….roseola (sixth’s disease). I’m happy to say that he is on the mend and will hopefully be cleared up in a few days. When his fever first started, it occurred to me that now I was dealing with a much wider and more dangerous range of diseases than this medically ignorant mom is accustomed to. I’m sure this has contributed to my abundant consults, but it also forced me to truly surrender my children to the Lord. As a parent, there’s a delicate balance between protecting them from perceived harm and letting them experience the world around them. I often cringe inside when someone (especially someone at the hospital) shakes my kids’ hands, knowing that their hands will soon be in their mouths before I have a chance to wash them. I have to entrust their health to the Lord in those small situations and in bigger situations too. It’s very easy to be consumed by fear, especially for my children and especially in Africa, but I have to trust that God loves my children even more than I do. He will not allow anything to happen to them that is not for His praise and glory. That leads me to pray for the strengthening of my own faith (“He will not be afraid of evil tidings; his heart is steadfast, trusting in the Lord.” Psalm 112:7) and for the protection of my family (“Because you have made the Lord, who is my refuge, even the Most High, your dwelling place, no evil shall befall you, nor shall any plague come near your dwelling.” Psalm 91:9-10). I’m grateful for physicians like Alyssa who are willing to wake up in the middle of the night for my peace of mind, but I’m even more grateful for the Great Physician who has proved Himself faithful and good to generations. This past weekend, I was on call for the Pediatric wards, which means that myself and the intern on call had to see all 60 or so of the children on the wards and in the NICU each day, and cover any neonatal resuscitations after delivery. A couple of weeks ago, this seemed incredibly daunting, but at the end of last week, I was feeling up to the task. I had it all planned out. The intern would see the Peds ward patients, while I came in early to start seeing the NICU babies. I would leave the NICU at 9am (to leave the ladies alone during the 8th day of Christmas) and go and see the floor patients with the intern, have some chai, and head back to finish NICU. All in all, I should be done by noon. The next several hours, I had to consult a total of 7 of my colleagues, despite my ardent desire that my efforts would enable them to have a well-deserved weekend off. During this time, the other baby died. I finally made it to the general ward, where I learned that my tardiness was not minded, given that they had been busy trying to save a little girl, whom we had been treating for HIV and TB. She also had just died. So, it was lunchtime, no work was done, a bunch of my colleagues had helped out from home, and two kids had died. For the sake of at least facade of brevity, I won't tell the whole saga. Five children died during my 48 hour watch. Each time I watched one die, I would pray for God to receive his small child, and each time it got harder and harder to trust in the subtle, yet powerful, albeit mysterious, goodness of God. It doesn't break my faith, but it creates a tension inside me, one that is greatly complicated by my feelings of helplessness, despite many years of my life, gone into training that is seemingly not nearly enough for the need around me. This tension makes me want to run, but I don't deny its presence. 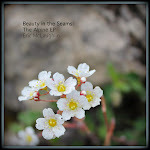 And I would assert that I have the Psalmists and a chunk of biblical prophets who would back me up. God, how can you let this happen? God, I can't do this. God, I still believe that you're good. Please, please, show me. There's so much death. How can I just keep going? Rachel wraps her arms around me, and softly says that God's strength is made perfect in my weakness. Later, Alyssa empathizes with the simple retelling of her own first call weekend, and reiterates that I can always call her at home. And late Sunday night, we gather in the Cropsey's living room and listen to an old sermon from Knox, where Chuck preaches a characteristically somber sermon on joy from Habakkuk, asserting that we must decide whether we will view God in terms of what we see in the world, or view the world in terms of what we see in God. This is only one part of life here, as our lighthearted exploits into pet squashes, milking moms, and dead geckos surely show. But it is significant. It is expected. It is incredibly hard. And by God's grace, I pray it be fruitful. "Give me an undivided heart, that I may fear your name." Wow! We had heard the water was a bit bitter here at Tenwek, but when Jessica and I drank our first glass (post-boiling, post-filtration) we could barely get it down. Dehydration appeared to be preferable until the primal urge to drink became irresistible. After about a week, I couldn't take it any longer. You see, the procurement of water has been of primary importance since creation. 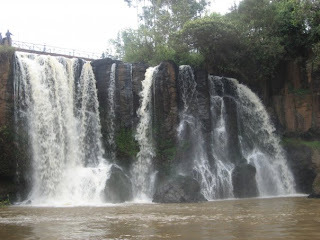 God put Adam and Eve in Eden with a fantastic water supply: "A river watering the garden flowed from Eden; from there it was separated into four headwaters...Pishon...Gihon...the Euphrates...the Tigris." Every would-be settler since has first procured a water source before settling any new civilization. Well, the McCropders weren't going to buck the system. Let me explain how things work here. The water coming to our indoor plumbing originates from this waterfall, which also happens to be the source of our electricity. It works great for flushing toilets, washing dishes and even taking a bath if you don't mind some exfoliatives (river bed sand). The drinking water, on the other hand, comes from our roof gutters and is stored in a big plastic water tank. Rain water is really clean. So why the wretched taste? I decided it was time to inspect the water procurement system. On first observation. the pipe connecting the roof gutters to the tank was disconnected. That would explain observation number two: the water level in the tank was only knee high despite it being rainy season. Perhaps we had stagnant water of unknown duration sitting in our tank? I climbed up and began to open the lid. Fumes began to emanate. I peered into a primordial cesspool. There was vibrant life in very dark water. This would explain the little worms swimming in our water when collecting a bucket of drinking water. We decided to drain the tank and have it cleaned with bleach. The quality of the water that began to collect was of significantly higher quality, with just a bit of a kick still. After several weeks of hard rain, our tank still only rose to knee height and the Faders and McLaughlins would soon be drawing from the tank too. On Jason's arrival, we agreed the gutter system was in disrepair. It was collecting little run-off from the roof and was not running downhill toward our tank. We summated the roof. What we found explained the remaining aftertaste in our water. 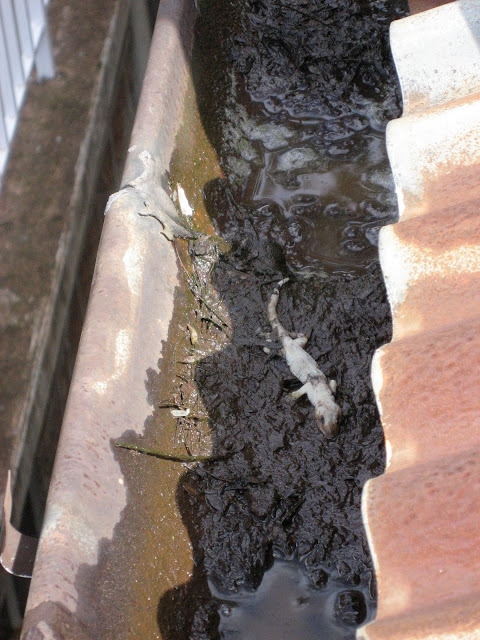 A layer of foul, black muck lined the gutters. Some poor lizard had fallen to its miry grave in the deadly goo. Umm, nice to think all of the water we had been drinking had been brewed in gutter stew. The vile muck was removed with our hands and a mop that has since been retired from indoor service. 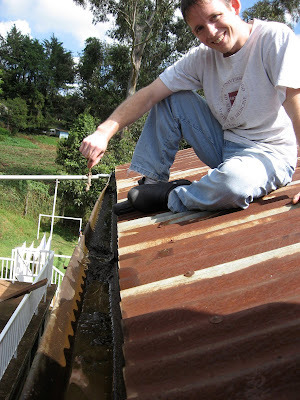 The gutters were adjusted and repaired to collect the rain and to send it downhill to our clean tank. After only a few days with several hard rains, our tank was running over with water (see the picture at the bottom with water shooting out of the overflow hole at the top right of the tank). We thank God for our renewed water source and a full tank as we approach the dry season. Much of what we encounter here is tragic. Much is beautiful. Sometimes our experiences are instructive. Some are perplexing. And some, like the unpublished story of John and the creepy Nepalese guy clinging for dear life to the roof of their Himalayan van, are purely snapshots that are best appreciated by stepping back and laughing as the absurdity of it. And I'd like to use today's position in the liturgical calendar to share just a moment. Against all my expectations, one of my major roles here at Tenwek thus far has been in the NICU (or the "nursery"), where we care for little 2 pound babies, as well as bigger newborns who are sick for one reason or another. Given that my training included a total of zero days working in such an environment, I've been scrambling to learn how to function there. How does one provide food for the 30ish babies pictured above? Especially when many are too young or sick to breastfeed? And without making them dependent on formula, which most families can't afford after discharge? Well, the answer can be seen every three hours on the dot, as a parade of moms make their way into the nursery wearing matching green gowns (for infection control reasons). 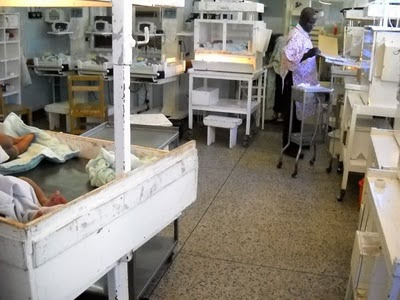 They wash their hands, and then sit on these short floor stools in front of their baby's incubator or cot. They then grab a couple very small plastic cups and begin to manually express their milk into the cups, which is then fed to their infant. There is nothing particularly humorous about this, but now imagine the tall skinny white male doctor, confused enough by learning the ropes of neonatal care, trying to awkwardly weave his way through the crowded milking hour, in order to see a few babies. Every one in a while, he tries out his fledging Swahili skills and meets with about 25% success and 75% loud silence. Welcome to my world. So, the Tenwek nursery is indeed a special place, for the 8th Day of Christmas visits the rest of the world only once a year, but in this one room, it comes every 3 hours on the dot.